here’s a list of questions we’re OFTEN asked at buxton hall. If your question Isn't answered here, feel free to send us an email at info@buxtonhall.com and we’ll get back to you! DO YOU TAKE RESERVATIONS? Unfortunately, we do not accept reservations or call ahead seating for any size party. We are first come/first serve only. That being said, we encourage you to come on the earlier side of the evening and you should be ok! We are also next door to Catawba Brewing Co., and folks often hang there and have a beer while they're waiting for a table at Buxton. DO YOU HAVE TAKEOUT/DELIVERY? Yes! To place an order for pickup just give us a call at 828-232-7216. For delivery we have a couple different options: UberEats and TakeOut Central. Please note that during busy days we turn off delivery service. WHAT IS THE PARKING SITUATION? There is street parking which is free. Otherwise there are paid lots all around. Unfortunately, we do not have a "free" lot specifically for Buxton Hall BBQ. WHAT ARE YOUR HOURS OF OPERATION? We’re open 7 days a week with lunch from 11:30am-3pm and dinner from 5:30pm-10pm. WHAT TYPE OF SERVICE DO YOU OFFER? We are a full service restaurant with a full bar. IS THERE A KIDS’ MENU? Yup! 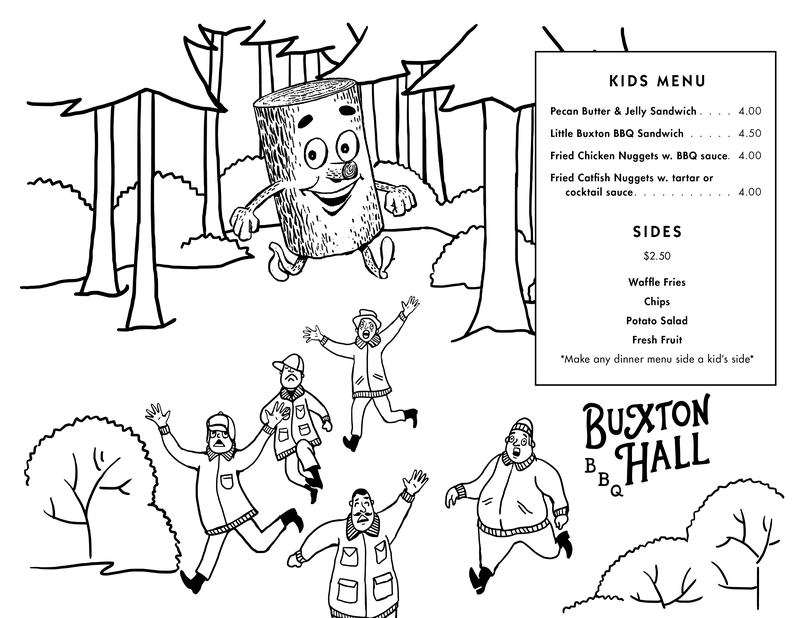 Click here for the kids menu. DO YOU ADVERTISE? We have fairly strict policy that we don't put any money into advertising. We instated this policy a few years ago and vowed to that instead of putting money into advertising, we put money back into our local community through give-back nights, community initiatives, and donations. CAN YOU ACCOMMODATE STROLLERS AND WHEELCHAIRS? Yes! DO YOU HAVE A COOKBOOK? Yes! Check it out online here. DO YOU DO CATERING? We have a private room, the Remingtin Room, which folks can reserve for large parties (wedding receptions, birthday parties, rehearsal dinners, etc.) we've even had a couple people get married up there! Service style is buffet style only. Email us at catering@buxtonhall.com. DO YOU HAVE GLUTEN-FREE OPTIONS? Our chicken, ribs and pulled pork can be prepared gluten free, and our salad is gluten free, as are many of our sides. WHAT IS YOUR BBQ STYLE? We do traditional whole-hog bbq, Eastern Carolina style. We cook all our meats over wood, the old school way. ARE ANY RECIPES AVAILABLE? We have a great cookbook! Check it out online here. DO YOU HAVE OUTDOOR SEATING? Unfortunately, we do not. ARE PETS ALLOWED? Service dogs are always welcome but otherwise no dogs, as we do not have an outdoor seating area. HOW CAN I PURCHASE A GIFT CARDS? You can buy Gift Cards in the restaurant or online by clicking here. HOW CAN I CHECK THE STATUS OR BALANCE OF MY GIFT CARD ORDER? Email info@buxtonhall.com with your order number or the number on the back of the gift card. HOW CAN I LEARN ABOUT EMPLOYMENT OPPORTUNITIES? Click here to see all of our job openings. WHERE IS YOUR CORPORATE OFFICE? We are located in downtown Asheville at 26 Battery Park Ave Suite 200. HOW CAN I PROVIDE FEEDBACK? Love the ‘que? Got questions for us? Feel free to send us an email at info@buxtonhall.com and we promise to get back in touch!